One of the things I didn’t know would happen to me before I became a blogger is that, over time, I would have several friends in the blogging world whom I’ve never actually met in person. It’s hard to explain how this happens – people come in to your life by commenting on your blog, or following you on Twitter or Instagram, or becoming a fan on Facebook, etc., and you get to talking and you discover you have much in common. Something (often many things) about who they are and what they are putting out there into the blogosphere resonates with who you are and what you’re putting out there. More time passes and you find you engage with them several times a week in any number of ways, support their work, encourage them, and they do the same for you. Sometimes you inspire one another. 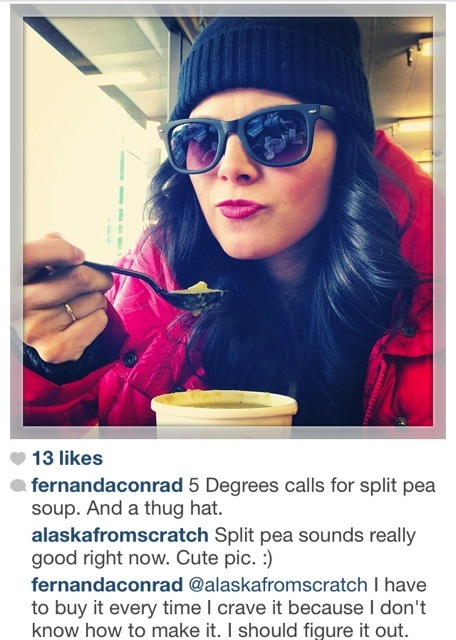 Meet my stylish Alaska blogging friend, Fernanda Conrad, from Fer the Love of Writing. Fernanda and I have never met in person. She likes split pea soup on cold Alaska winter days. And, come to think of it, so do I. Later that day, I received an email from Fernanda officially requesting a recipe for just such a soup. And just like that, inspiration strikes. This past week, I was suffering from this terrible cold (flu perhaps?) that’s been going around our state and, upon seeing this picture, all I wanted was a pot of steamy split pea soup. As soon as I was well enough to go to the store, this is what was on the menu. Shopping note: I like to pick up my split peas (and lentils, too) in the bulk dry goods bins at the supermarket. They always look a little more colorful and pretty than the bagged ones on the bean aisle. 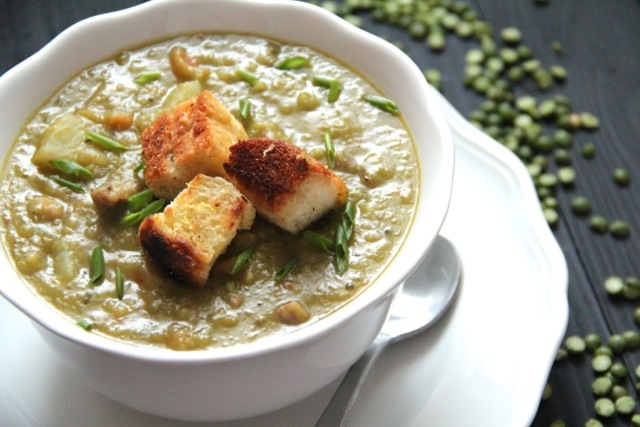 Split pea soup is high-protein, inexpensive, and amazingly good for you. It’s stick-to-your-ribs, warm-you-up-in-cold-weather good. And the homemade Lemon & Olive Oil Croutons are pretty amazing. They give you the texture and crunch you’ll want to contrast with the soup and the lemon cuts right through the richness and thickness of it. So, Fernanda, my dear, this one’s for you. 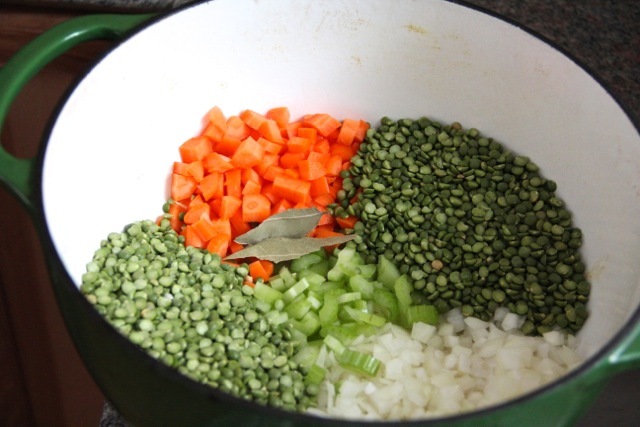 Thick and hearty Split Pea Soup for a cold winter’s day. Served with bright Lemon & Olive Oil Croutons for a little texture and a little acid to cut through the richness of the soup. To a large pot, add the onions, carrots, celery, garlic, peas, bay leaves, thyme, salt, pepper, and ham hock. Cover with water, turn heat to medium-high, and bring to a simmer. When the soup comes to a simmer, a bubbly film will rise to the top of the pot. Skim this off and discard (if you get some vegetables and herbs when you skim, simply rinse them and return them to the pot). Then, cover the soup leaving the lid just slightly open, and reduce the heat to medium-low. Simmer, stirring often so the soup doesn't stick as it thickens, 1 hour. Remove the ham hock to a cutting board to cool. Add the potatoes to the soup and stir. Cover and cook another 30 minutes or until the potatoes are soft and the peas are no longer firm (they turn to mush and become the thick base of the soup). During this time, remove the meat from the hock and chop it up finely, discarding any fat. Stir the ham into the soup. Turn off the heat, remove the bay leaves, and stir in the fresh lemon juice. Taste for seasoning and adjust salt and pepper as needed. Serve hot with chives, if using, and croutons. *If you prefer a smoother soup, you can blend all or some of it with an immersion blender until the desired texture is achieved. I prefer mine hearty and chunky, so I did not blend it. Preheat oven to 200. Place the cubed French bread on a baking sheet in a single layer. Bake the bread for 15-20 minutes or until it is dry to the touch on the exterior. Heat a large frying pan over medium heat. Drizzle the bread generously with olive oil and toss to coat. Cook in the frying pan in batches, turning often, until croutons are golden and toasted, adding more olive oil if needed to get them crispy and browned. Season with sea salt and black pepper and top with fresh lemon zest. Serve warm over soup.